A welcome mini-heatwave shone across London as the Victoria Park league entered its third week of competition, with the end of phase one beginning to come into sight. With no play on Monday due to the Bank Holiday, Tuesday saw Sayad Ahmed (50) and Rafiqul Rashal (41) star with the bat as the London Tigers defeated Mad Marrocas by 28 runs. Responding to the Tigers’ 146, MM fell short on 118-7. 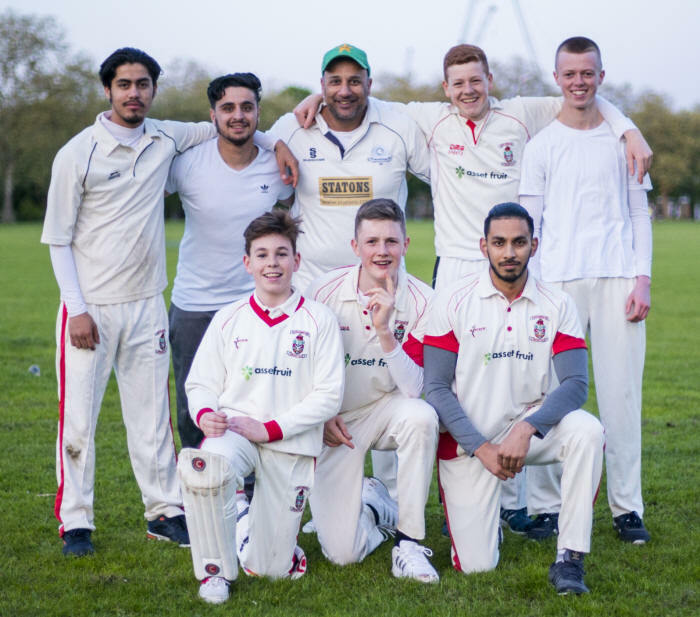 In what’s turning out to be an exciting group, London Fields looked in superb form as they beat Broadway Market by 63 runs on pitch 2 . London Fields completed their 16 overs with a score of 155-4. Will Issac starred with the bat hitting 53 with support from Paul Teasdale (39) and Oli Turner (30). Broadway were bowled out for 92 in just under 12 overs, Faisel top scoring with 23 and Dennis Mcdonagh taking 2-8. On Wednesday, defending champions Rose & Crown put Homerton into bat and watched on as Hutch (42) and a quick fire 26 from Mark helped Homerton to tricky 131-6. Rose & Crown made a superb start putting on 88 for the opening wicket. Joe Fisher dazzling with the bat retiring on 55 as they scrambled to victory with just two balls remaining in a tense finish. Meanwhile Best Nationals struck a formidable 160-5 in their 16 overs with Irfan Abbas (44) and Suraj (45 not out) sparkling with the bat. Sports Interactive completed their 16 overs falling 45 runs short, despite a great opening partnership between Tirath Singh (50) and Keith Flannery (45). Thursday saw Stokey Scoundrels continue their great start to the season seeing off Ex-Pats. The Scoundrels hit 159-2, Sarafat Ali once again starring with the bat hitting 50 and with Riz Siddiqi hitting 41 before being caught by a great catch from Mike McGhan. Ex-Pats suffered an early injury retirement before finally falling short of their target finishing on 113-5, with Alex Hickson returning to the crease after retiring on 50 and hitting a composed 63. Next week sees the finale of phase 1 before the teams are separated into two divisions.